Submitted by lynn on Monday, March 23, 2015 - 11:48pm. It was half past 8 and we were starving for dinner! 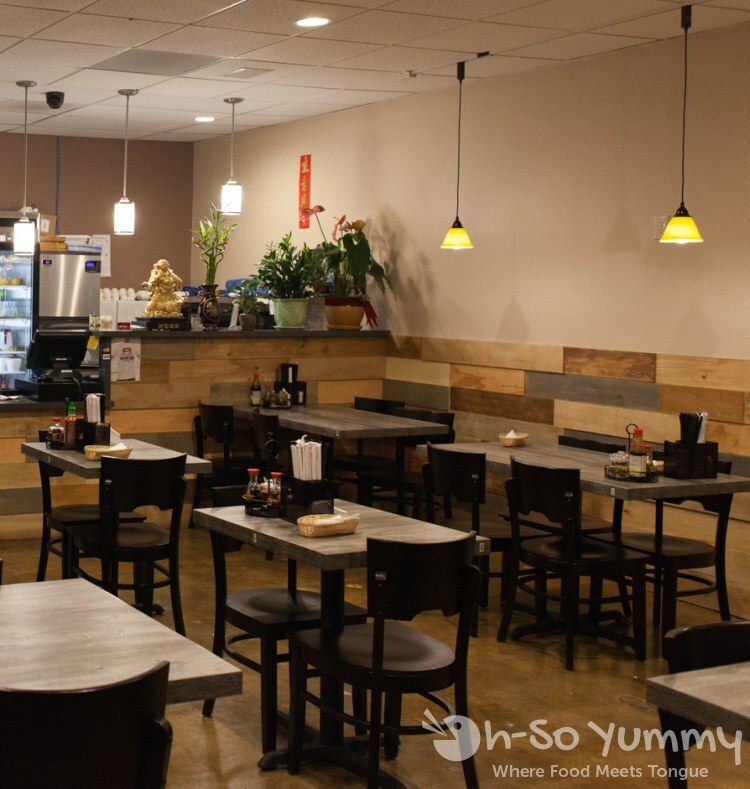 A quick yelp search in Mira Mesa led us to Tim Ky Noodle, open until 9:30pm, later than most Vietnamese places in the area. Dennis whispered to me that it was in the same spot as Tan Ky Mi Gia, which had been here for ages. A staff member confirmed the new ownership and name change. The new restaurant had been open for 2.5 months and was pleasantly decorated; I especially loved the neutral paneled walls and the woodgrain table finish. Also there was plenty of light inside which is always great for taking food pictures! After a brief glance at the menu appetizers, we were already ordering the Fish Sauce Wings (6.99). Maybe I'm addicted after wing week and various other wings but this "fish sauce" flavor caught my eye! After a bite or two, I was pretty happy with the result, a slight drizzle of mellow fish sauce that didn't soak the crispiness of the skin during stir-frying. There were red peppers in the plating but no heat from that effort. I didn't have any complaints about the chicken meat inside other than the wings were on the smaller side. The plate contained about 8 pieces. Great flavor overall. Dennis wanted a sampling of their noodle specialties so our first bowl was the Wonton and Dumpling Noodle Soup. 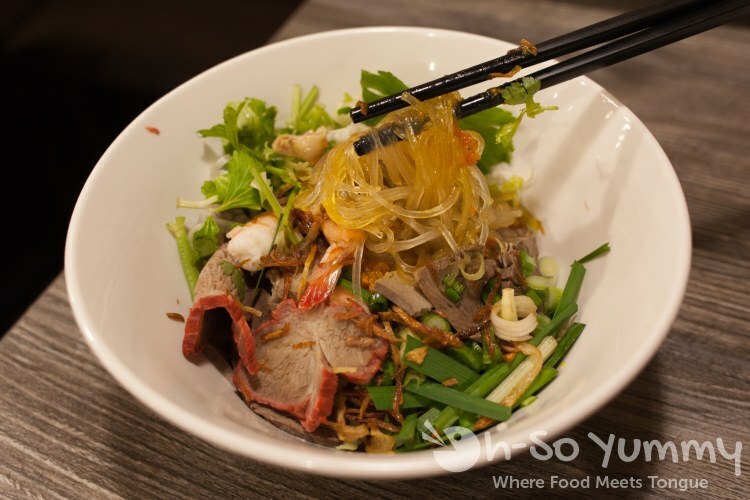 You can choose either the white rice noodles or the yellow egg noodles for each bowl. For me, I didn't like the egg noodles as much, a bit too al dente for my taste, and I found the soup broth to be super light. Dennis thought they were typical tasting and that my opinion may be skewed toward pho, which is a different style and taste! A good thing about the light broth here? You can slurp it all without feeling as sodium-heavy. Topping-wise, the red edged pork meat was tasty though a little on the fatty side. The wonton and dumplings didn't stand out in any way, good or bad. The side chip had a random salty dried shrimp in the center and felt a little out of place for us. 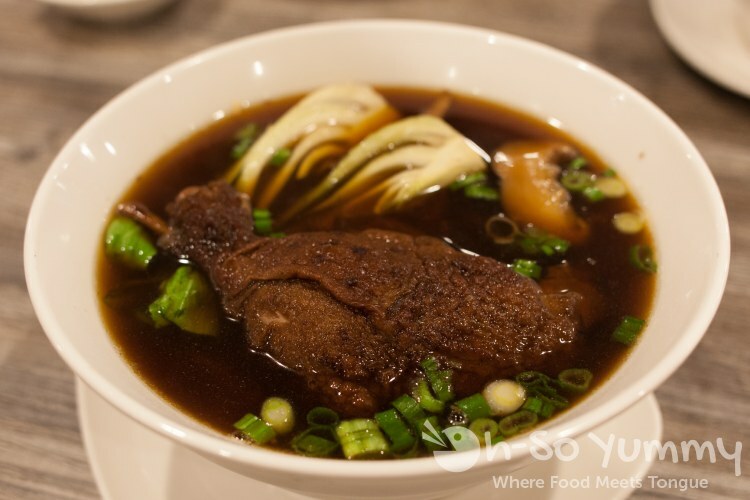 Our next bowl was the Duck Leg Noodle Soup. This was actually the same chicken broth base with the addition of chinese five spice. Perhaps the spices were too strong for me but I preferred the simpler broth of the first soup. Dennis mentioned it smelling a little like medicine though (is that the star anise?). The meat itself was part of a big leg with plenty of duck meat mostly falling off the bone with ease. Dennis let me eat most of the bok choy. Yay veggies! We came back the next day to give the Salt and Pepper Wings (6.99) a try. Dennis appreciated the more buttery quality of these chicken wings but that characteristic made it a bit greasy for me. I also thought these salt and pepper wings needed a little more S&P! On my very last piece though, I hit a clump of seasoning so perhaps it needs to be spread more evenly during cooking. 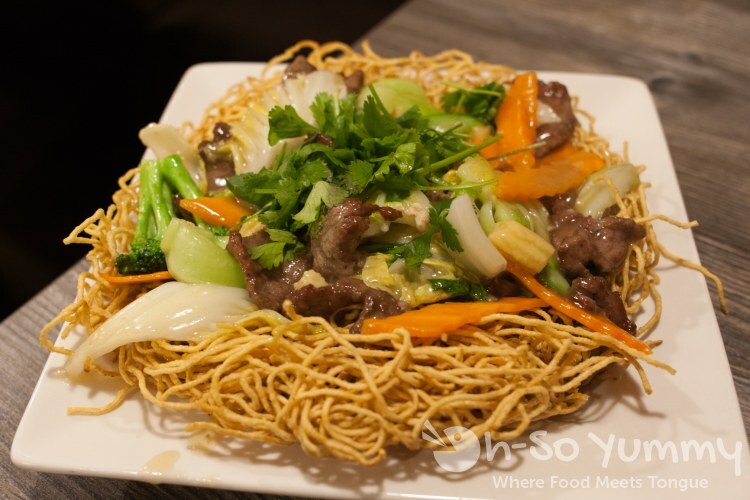 The infamous bird's nest, known as Beef Crispy Noodle (7.99) here. These lo mein noodles were soft enough to break easily with a little pressure. It was crunchy yet not hurt your gums crunchy. Maybe I went somewhere terrible in the past but I had always thought these noodles were crunchy hard. Glad this wasn't the case here. The noodle areas that soaked up the stir fry gravy were yummy and we could even mix crispy and non-crispy textures into one tantalizing bite. The meat and veggies were cooked well with this dish. We asked for other options to try and ended up with My Tho Rice Noodle (7.99), requested with the soup on the side. These noodles were different because japanese noodles were used instead. Dennis also pointed out that ordering this way allows you to taste the noodles better though usually for this style, there is extra flavoring added to the dish since it is "dry." Here's a recreation (of sorts) in tribute to our long time banner from the early OSY days. We probably should have done this on our first visit with the wonton noodles. I had originally planned to order bun thit nuong (vermicelli with pork) on this second visit but Tim didn't recommend it, telling us that the the menu was actually changing the following week, mainly removing Vietnamese 'bun' and one other Vietnamese styled dish, but would still have all the chinese style noodle dishes as before. I still need a little more noodling experience but for now, I'll be thinking of this place for fish sauce wings and a decent birds nest... plus I can't wait to see the next shirt design! 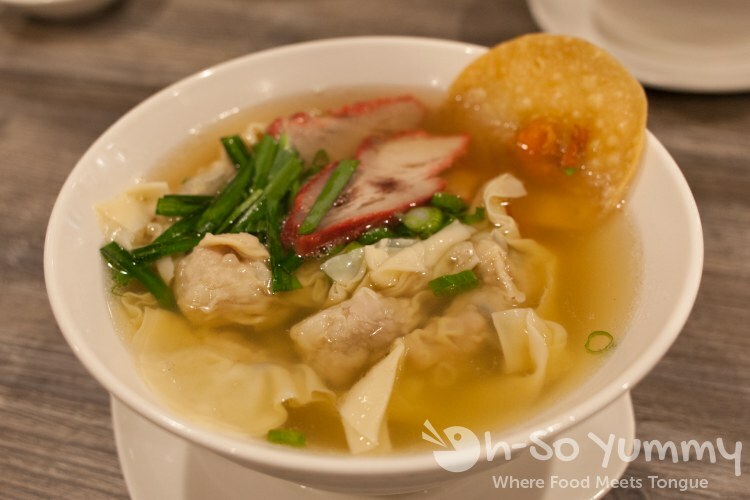 Oh man that wonton/dumpling soup looks so good right now. I seriously would eat that for breakfast. I totally hear ya about the wonton/dumplings being lackluster though. I hate it when that happens b/c shouldn't they be the star of the dish. I'm in awe at your chicken wing tenacity ! The ones here look alright. 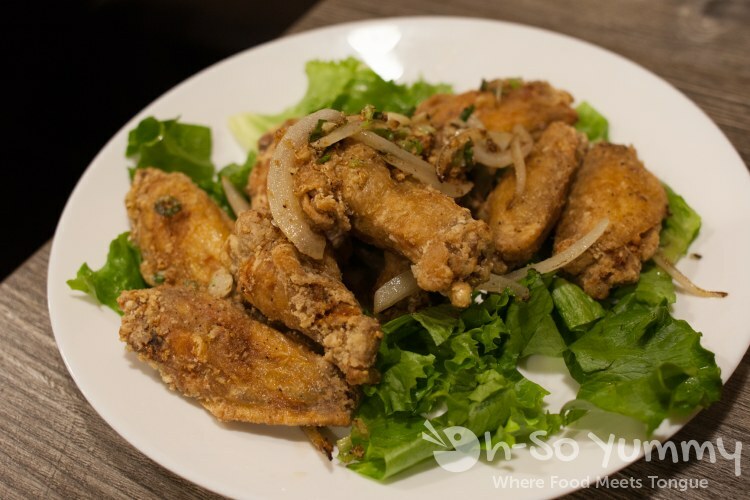 I recently tried the fish sauce wings at Phoung Trang and they were ok (not sure if you've tried those yet?). 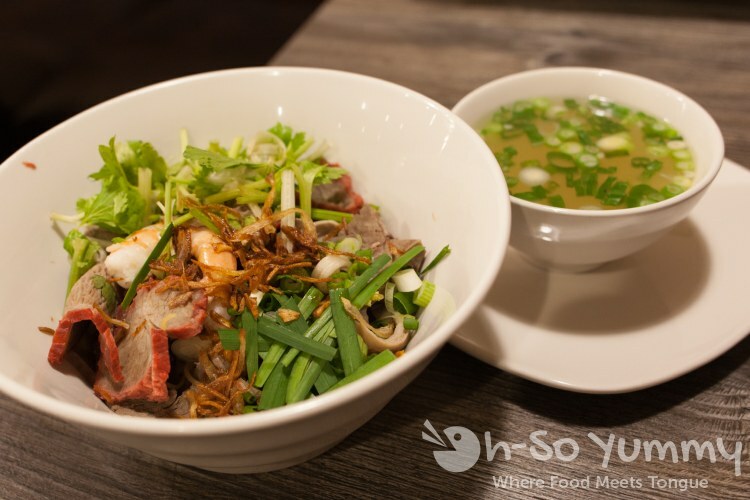 I've never tried My Tho Rice Noodle - how was the broth on the side? Wonton/dumpling soup is like a special treat since I don't have it often. I still haven't tried enough chicken wings in San Diego. Need more. The broth was pretty much the same chicken broth as in my first bowl of noodles so nothing too different. 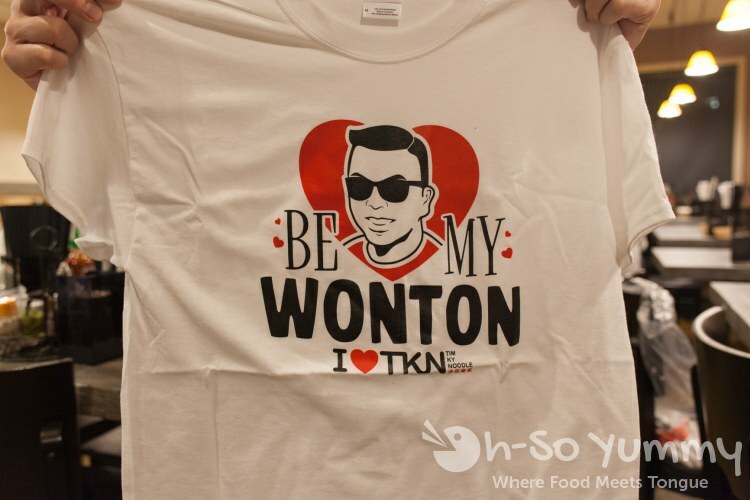 That shirt is awesome! I've been wondering about that spot. I never went before either, I never think of it. 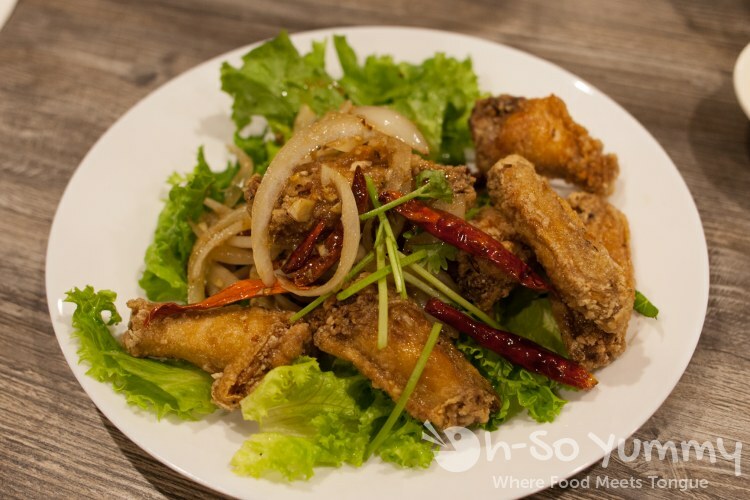 The fish sauce wings sound good, they have delicious fish sauce wings at Que Huong and that's the only place I've had them before so I'd like to try those out! I rarely go to that plaza and even then its just for the banh mi shop. Hmm, need to try more fish sauce wings, but thinking LA is gonna be a hot spot for that! Actually I think we went somewhere recently when visiting the family in OC. Gotta find that pic and see if I wrote any notes for it.